Mara was badly injured in January 2010, when a severe earthquake suddenly struck and devastated Haiti. Tragically, it killed Mara's Mother and sister, and as the hospitals in Haiti were completely overwhelmed with victims, she was taken by her Aunt to the Dominican Republic (DR) hoping to receive emergency treatment there. Unfortunately, due to the huge number of victims, even the main hospitals in the DR could focus only on triage rather than primary care. Mara was one of the lucky ones, she was relocated to a field hospital set up on the premises of Love a Child orphanage. After five complicated surgeries, including a leg amputation, Mara is finally on the road to recovery from her physical and emotional trauma, thanks in part to the crutches donated by Crutches 4 Kids. Mara is now able to join the other children on the playground near the hospital. Mara, along with other kids who are recovering from injuries, are able to lean their crutches on the playground equipment and play with the rest of the children on the swings and slides. Having crutches enables Mara to become social again and to spend time with friends, like Valedene, another young amputee who also benefited from crutches from Crutches 4 Kids. The 2010 earthquake in Haiti had a devastating effect on the country and its people. Over 6,000 people lost a limb during the earthquake and many required mobility devices, like crutches, to walk. While the earthquake highlighted the importance of the supply of crutches after a natural disaster, many countries have an on-going need for them. Often times, in countries like Haiti, the supply of crutches cannot meet the demand. In 2011, a family of orthopedic surgeons who are affiliated with Crutches 4 Kids went to Haiti to help children in need of surgeries and mobility devices. Dr. Aldo Vitale from Lutheran Medical Center and Dr. Mark Vitae and Mike Vitale from Columbia University Medical Center went to Haiti in 2011 and performed about 60 surgeries. Their experiences underscore the importance of having appropriate mobility devices, like crutches, to help children lead healthy and fulfilling lives. The Vitales met many children during their time in Haiti that needed crutches. They met Estephanie, a 12-year-old who had Blount’s disease, which caused her knees to angulate outward and made it extremely difficult for her to walk without a pair of crutches. The doctors performed a corrective surgery and with a pair of crutches to help her rehabilitate, Estephanie will be able to walk without an assistive device. They also met several young men who sustained injuries to their legs during the earthquake, and like so many other Haitians requiring crutches, only had a single crutch to lean their weight on, which can cause other injuries. A pair of crutches was vital to their ability to recover from their injuries. Their visit showed the importance of crutches in helping young people get back on their feet. Crutches 4 Kids partnered with the New York Dermatology Group to help children amputee soccer teams in Haiti get back on their feet! Crutches 4 Kids sent a shipment of crutches to help these budding soccer champs grow, play, and learn. In the aftermath of the 2010 earthquake in Haiti, 6,000-8,000 people lost limbs, and children were especially vulnerable. The New York Dermatology Group has been supporting soccer teams with children amputee victims to help them recover from their trauma and lead a fulfilling and productive life. The teams meet twice per month and their coaches, led by Wilfrid Macena, inspire and motivate them. The children, who live in the Port Au Prince area, practice every Saturday and look forward to playing with their friends and running in the fresh air. 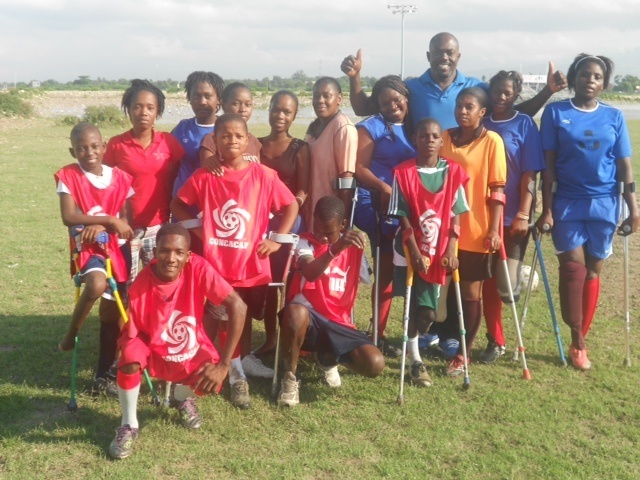 Earlier this year, Crutches 4 Kids sent a shipment of thirty pairs of crutches to help these soccer teams. These crutches are extremely valuable and rare in Haiti, and will allow the children to more effectively walk and play, as well as boost their confidence and autonomy. One soccer player explained the importance of playing soccer to him: “I feel good because I found people that support me. People support me and my team supports me. I feel proud.” Another child said that he wants to play soccer so that “I would become a great soccer player like Messi, Christiano, and Ronaldinho.” Check out this video of some of the kids playing soccer with their new crutches. Crutches 4 Kids’ mission is to provide crutches to children in need around the world. Crutches 4 Kids works in partnerships with hospitals, physical therapy offices, humanitarian organizations, and concerned citizens to collect gently used crutches and distribute them to places in need. For more information on how to get involved, please click here.